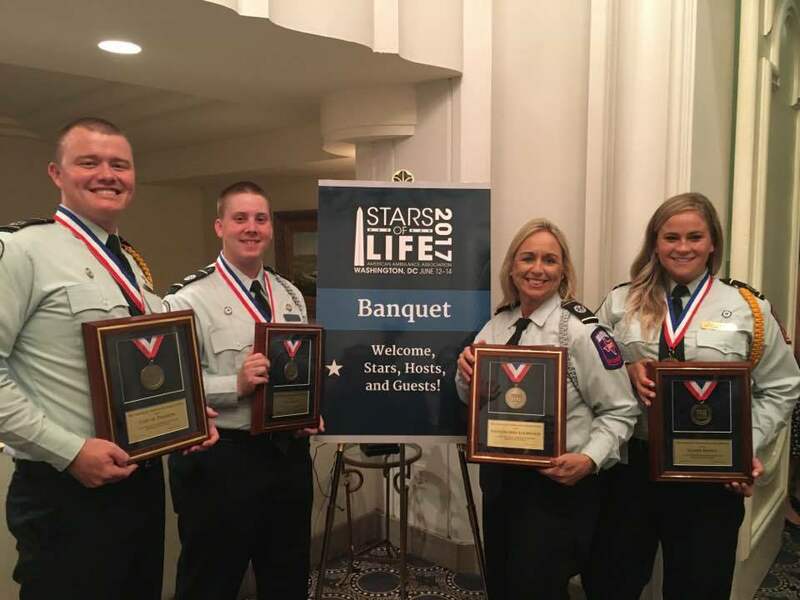 Acadian Ambulance Paramedics Coty Peardon (far left) and Sloane Brown (far right), as well as Emergency Medical Technicians Tyler Niblett (second from left) and Rhonda Dees-Lockwood (second from right), represented the company in Washington, D.C. at the annual American Ambulance Association (AAA) Stars of Life event. AAA’s Stars of Life program celebrates the contributions of ambulance professionals who have gone above and beyond the call of duty in service to their communities or the EMS profession; honors the contributions of these heroes; and shines light on the critical role EMS plays in our healthcare infrastructure. The four medics were chosen to represent Acadian Ambulance after they were nominated by their peers and chosen as the company’s medics of the year by an internal selection committee. “Being recognized as the Texas EMT of the Year in our nation’s capital was a life-defining moment that will forever hold a place in my heart,” said Dees-Lockwood. During the weeklong event, Peardon, Niblett, Brown and Lockwood visited with House Majority Whip Steve Scalise (LA), Representative Ralph Abraham (LA), Representative Roger Williams (TX), Representative Garret Graves (LA), Representative Brian Babin (TX), Senator Bill Cassidy (LA), Representative Steven Palazzo (MS), and Representative Clay Higgins (LA). “I brought back a new appreciation of our elected officials and the work that they do. We saw votes in progress that could change the way we live our lives for better or worse. I had never realized just how important our politicians are, and had honestly taken their work for granted until now,” said Peardon. They also participated in panels and exercises featuring other Stars of Life from around the country; and received medals and pins from AAA to commemorate their Stars of Life honor. AAA 2018 President Mark Postma presented the honorees with their awards. Also in attendance representing Acadian were Vice President of Governmental Relations, Asbel Montes, and Chief Medical Officer, Dr. Chuck Burnell. “Our Paramedics and EMTs of the Year were able to meet with our Texas, Louisiana and Mississippi senators and congressmen, and they provided a first hand account of the importance of both emergency and non-emergency ambulance transportation services in the communities we serve,” said Montes. Peardon and Niblett, both medics in Jackson County, Mississippi, were honored at Acadian’s annual Medic of the Year Luncheon in Lafayette in May 2017, and Brown and Lockwood, representing the Central Texas and Houston service areas, will be recognized during a Medic of the Year event in San Antonio in October 2017. Since 1971, Acadian has been dedicated to providing the highest level of emergency medical care and transportation possible. The company has expanded to include a diverse suite of services designed to offer the very best support and education in health, safety, and transportation. For more photos of Acadian at the AAA Stars of Life, please visit our Facebook page.